They say 'location' means everything. "Wildwood" cabin is 7 minutes from the city of Lafollette, 5 minutes from the main road, inside a gated community, right on the water's edge, and the boat ramp right around the corner. 6 sets of bath towels provided for each bathroom. 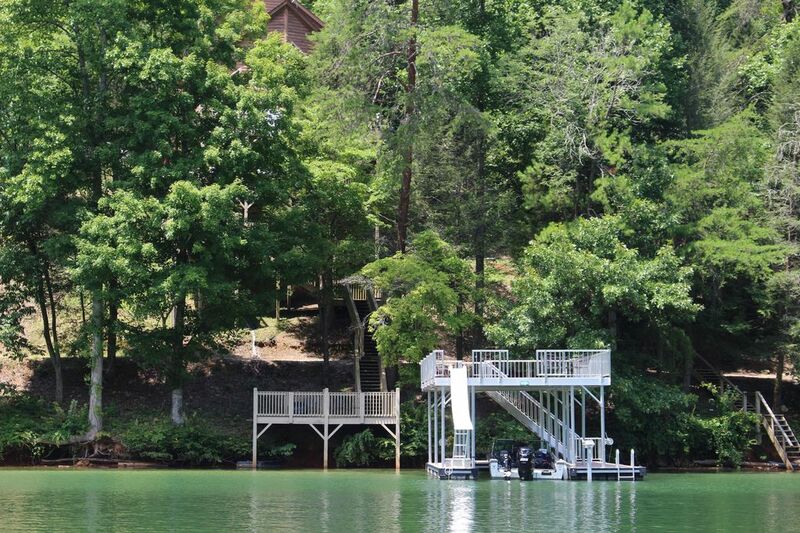 "Wildwood" at Norris Lake is the perfect place to gather with your friends and family with plenty of space and things to do. Please call us for suggestions on golf, boat rental, restaurants, bedroom details, etc. We are here to assist you. We enjoyed the view , we expect snowing , but no , even though we enjoyed beautiful weather to go the mountains. Great location near the bridge, the house was clean, easy access to the dock with covered boat slip. Would recommend to anyone. The “living area” needs blinds! Double decker dock w/slide was a BIG hit. It’s necessary though seeing there’s No beach. House was large and accommodating!!! The house very large and clean. It accommodated our smaller party very well. When we arrived on Saturday there was a vehicle in one of our spots. Contacted the owner and he replied that they did not know who owned the vehicle, however, if we needed, he would have it towed. I let him know that we would need the car removed. The car sat there until Weds. We had decided we would call the local police as it seemed very odd that a random car would be sitting there for so long with no one coming to retrieve it and the owner never had it removed. When we returned from boating on Weds. afternoon the car was gone. In the information that was sent we were told that there were limited trash bags and paper towels. We didn't realize that it meant, there would be 1 trash bag and about 4 - 5 pieces of paper towels left for us. We have stayed in several houses on the lake previously and this was the 1st time that we had to immediately go out and buy paper towels and trash bags. We liked how the house was set up and we were all very comfortable. We enjoyed having the tv's in different areas of the house, including the bedroom. It was nice to be so close to the jumping bridge as well as at least 2 different marina's. We had a wonderful family vacation here. Five families and plenty of room. The property was well kept and the house was in great condition. The kitchen was fully stocked and the beds comfy. The owner was quick to respond and send someone out when we had trouble with the wiifii. We are already planning our next trip back here. Loved the location and spaciousness of the house! The docks were a great place to hang out when others were boating. We enjoyed kayaking, paddle boarding, wake boarding, skiing, tubing, swimming and fishing. There was plenty of room in both refrigerators to store all of our food. The foosball was a bit hit in the evening. Our grandsons said it was the best vacation ever! The hot tub was great. The view was spectacular! We celebrated our golden anniversary that week and could not have made a better choice. Everyone suggested making it an annual event!